The Prince Laurent Foundation has chosen Cali (pictured) as this year’s Nicest Zinneke. Zinneke is old Brussels dialect for a mongrel and is now used to describe Bruxellois, or a resident of the capital. The foundation provides veterinary services to pets belonging to the homeless or to low-income families. With five locations across Belgium, it works with veterinary professors and students from two universities to provide health care to animals regardless of the owner’s ability to pay. Every year, a contest among the foundation’s canine patients seeks to find the one with the ‘most sympathetic’ personality, and this year there were 22 entries. The very friendly competition took place on Saturday on Place du Jeu de Balle in the Marolles in the presence of Princess Claire and her children. The day started with an Open House of the Brussels chapter of the organisation, located on the square, and a demonstration by the fire department’s dog brigade. 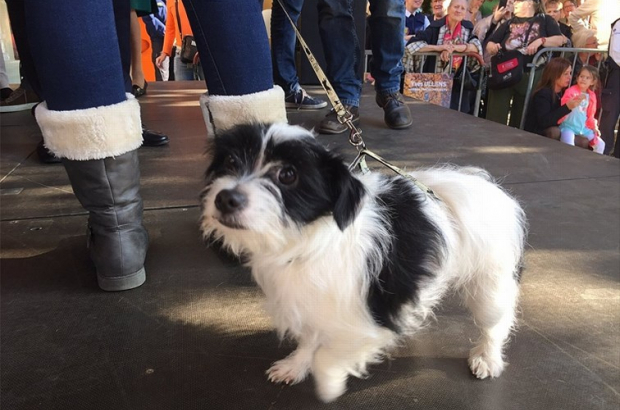 Then the dog parade brought the jury into contact with contestants, and the prize was ultimately awarded to Cali – like most of the entries a mixed-breed – by Brussels-City mayor Philippe Close. Cali wins a medal and a free trip to a dog groomer. More to the point, a zinneke is a mutt. The Zinneke was a small branch of the Senne/Zenne river (Zinne is Brussels dialect) and the story goes that mutts that no one wanted were drowned in the river, thus the name of the river becoming the term for mixed breed dogs. So the Most Beautiful Zinneke contest is a contest exclusively for mutts. More recently, the term Zinneke has been applied to humans of mixed ethnic backgrounds and by extension to all Brussels natives since Brussels is so multi-cultural (and was, even historically).